We set out on Saturday morning at the crack of dawn along with MOONSHINER and JADEN to complete our first and last overnight passage in Malaysia. Despite the armadas of fishing boats and stormy conditions, it actually was not too bad. JADEN turned aside north of Padang to spend a few days there. They are making their maiden voyage aboard their lovely new ketch and are doing things the hard way- starting off through the Singapore Straits! We hope they will enjoy the cruising life. Our destination this time was the northernmost area of Malaysia- Langkawi, which is located right on the Malaysia/Thailand border. Dave and I have visited this fabulous area by plane before. Coming in by sea is even more spectacular. There are dozens of islands forming a very sheltered watery playground where you can anchor virtually anywhere. The karst limestone formations rise majestically from the sea, forming an enchanting backdrop to calm anchorages. It is stunningly beautiful. The only fly in this heavenly ointment is the exponential boom in tourism since our last visit. 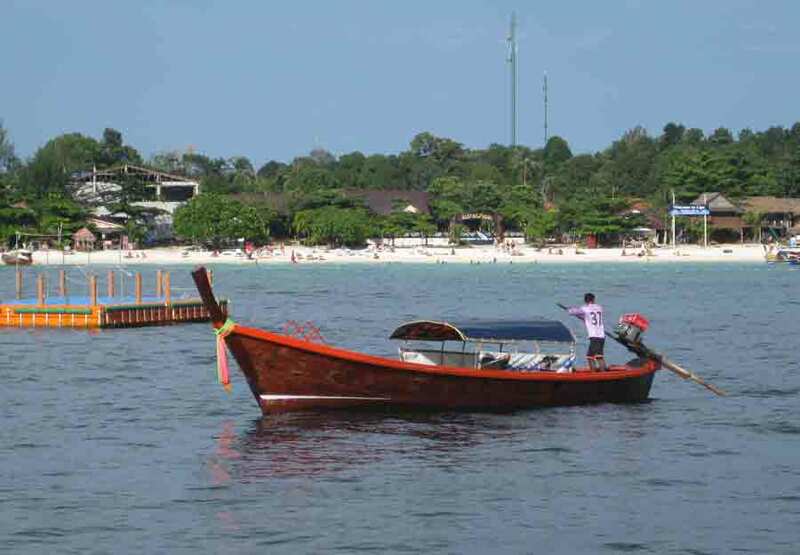 As a consequence, all through this region and everywhere around Phuket in Thailand there are dozens of day-tripper boats rushing to and from the natural attractions. However, before they get busy in the morning and later in the afternoons, it is idyllic. We anchored at this lovely spot, sheltered from the southwest swells and the northwest winds. It was the best night's sleep in ages! 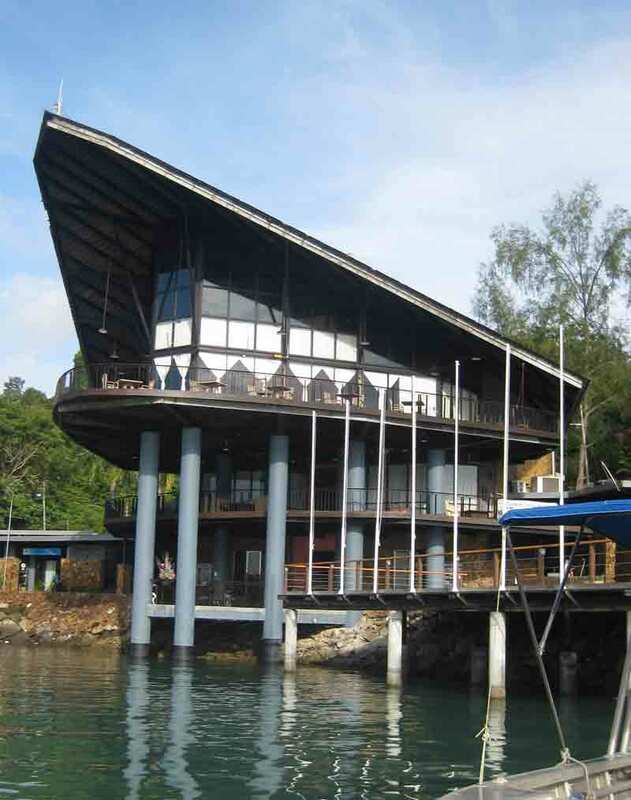 We had virtually despaired of finding a berth at a marina in order to check out of the country, but managed to gain one at the Royal Langkawi Yacht Club, right next to the international ferry terminal, which allowed us to do all the paperwork in one spot. We also ran into the other laggards in the rally, MOONBEAM and ISLAND KEA. It was great to have friendly dockhands who guided us into our berths and helped get us secured! The clubhouse is quite spectacular and the staff very friendly and efficient. We didn't find enough time to try out the pool, but other yachties seemed to be enjoying it. Instead we hopped aboard a taxi and headed for a distant warehouse, where we searched among the jungle of cartons for bargains on duty free beer and liquour. It was a great way to have a quick tour of the nearby villages. Next up was a trip to the ferry terminal mall to hunt for bargains- and the final supplies of spirits. Unfortunately, Sara and I got a bit distracted in a couple of shops and didn't see Dave leave ahead of us. 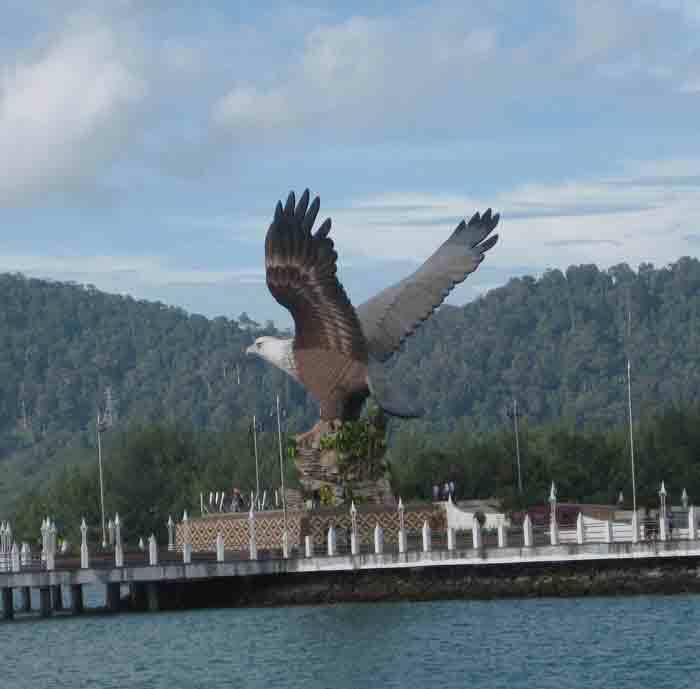 While we sleuthing about looking for him, I managed to get a snap of the Langkawi Eagle in front of the ferry terminal. We couldn't believe how Americanized this area of Malaysia was- Kenny Rogers Roasters, Baskin and Robbins, Seven-Eleven, KFC, Starbucks. And that was just on one small street! At 0800 we set off on Monday morning to start the last 180nm to Yacht Haven in northern Phuket. Now we could have done this in an overnight sail if it was possible to travel directly. However, from previous reports from fellow ralliers we learned that this was to be avoided at all costs- day sails only! LUCY ALICE attempted the direct route and managed to become entangled in five fishing nets in one night! 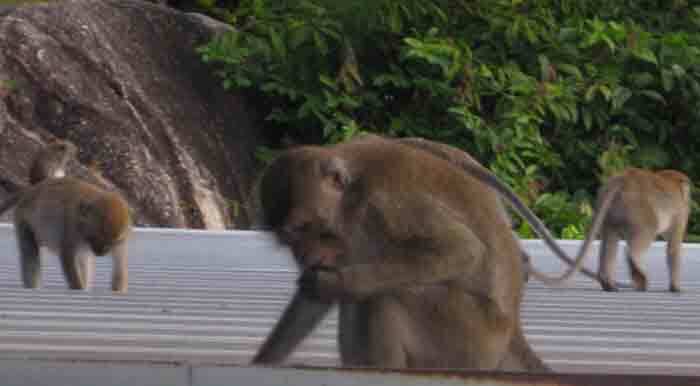 Accordingly, our first "sail" was just 35 miles to Koh Lipe, barely out of Malaysia. I use the term "sail" loosely, as, other than a couple of weeks good sailing in September along the Great Barrier Reef, we have actually been motoring since mid-August! We are praying that the January northeast trades materialize. 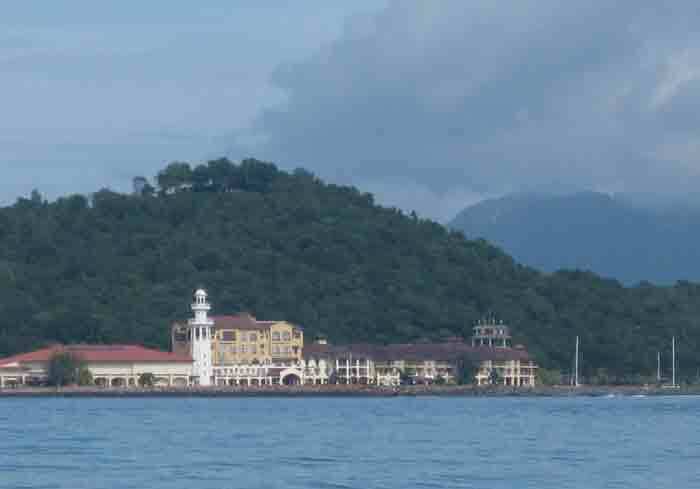 This is a photo of the lovely cruise ship terminal as we left Langkawi. 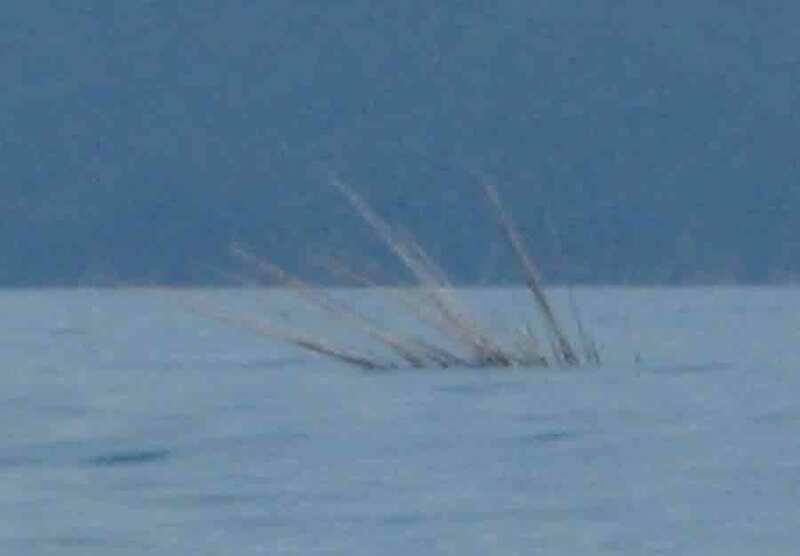 Shortly after we left Malaysia, we finally caught sight of one of their infamous fisshing spikes. Apparently fish like to huddle at the roots of vegetation. The fishermen construct these spiky bamboo floats and then check them for finny food. Just after we passed these spikes, we were surrounded by hundreds of jellyfish. I was beginning to rethink the swim I had been promised when we reached Koh Lipe! Then, just to make the decision more difficult, I saw a HUGE creature with a shark-like dorsal fin. A few minutes later it was surrounded by many other similar (but smaller) fins. SHARKS! The biggest one eventually swam towards and underneath MOONSHINER. Sara identified it as a whale shark. Finally, we did reach Koh Lipe (Koh means "island"). It certainly has changed since the pilot book was written! Instead of a village and small restaurants on the beach, it now resembles a mini Las Vegas- with resorts and nightclubs everywhere. It is very dramatic at night. By day, there is a beautiful white sand beach with good snorkelling. 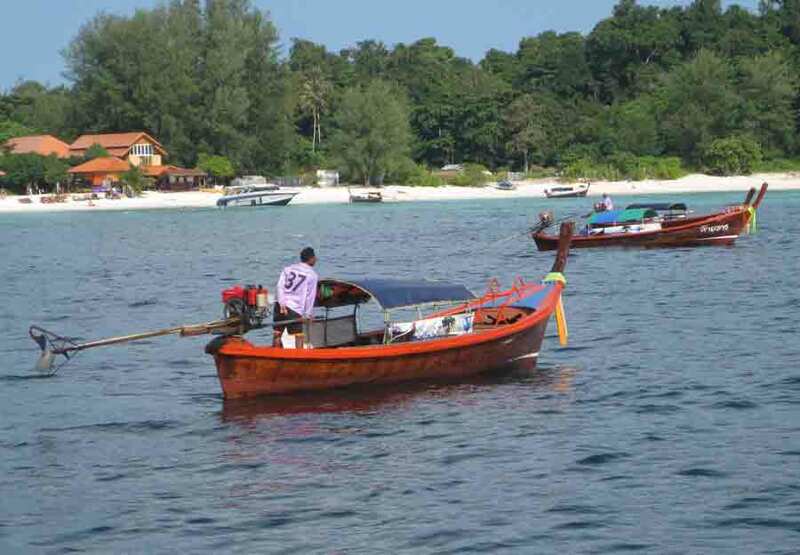 The main obstacle to overcome is the plethora of longtail boats. These boats are ideal for travel in shallow waters. The outboard motor has a shaft about 3 metres long and works like an eggbeater at the surface of the water. dave says it is basically a car drive shaft with a propeller at the end. Whatever it is, it is NOISY! Anyway, to answer the question of whether or not I went for a swim....... most definitely!